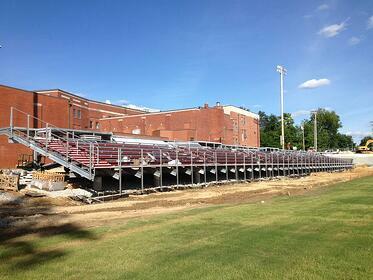 Putnam Stadium is getting a major facelift. This historic landmark is home to the Ashland Paul G. Blazer Tomcats and is currently in the process of renovations to revitalize and rejuvenate their trusted football facility back into working order with several new additions that are sure to bring fans to their feet when the project is complete. The Putnam Stadium Restoration Foundation attempted to raise $5.1 million to complete a two-phase project to include new stadium seating and locker room facilities, a press box, infrastructure work, lighting, new artificial turf and practice field, a banked end zone, parking lots, a donors corner, championship flag poles and a unique Tomcat statue. Toadvine Enterprises is pleased to assist Paul G. Blazer high school in completing these renovations. Toadvine will be adding a home and visitor side stadium with mitered corners that flow into an existing concrete end zone. The original stadium was pre-cast concrete and was demolished in February. Toadvine is providing a welded, aluminum grandstand with a poured concrete rear walk surface. The home side of the stadium will be enhanced with powder coated riser boards in school colors and VIP chairs and backrests for the home side. The new stadium look should be complete in early July, in plenty of time for the season opener on Friday, August 22 with Newport Catholic. If your stadium is in need of an overhaul, or just needs some a few updates to keep fans safe and enthusiastic, contact Toadvine and we can provide you with a quick quote for any bleacher seating renovations or sporting equipment your school or organization might need.